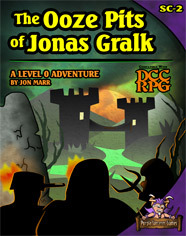 I'm excited to announce that the 2nd Sunken City Starting Adventure, The Ooze Pits of Jonas Gralk, is available at RPGNow! I've had a really fun time creating this one while weathering all the Kickstarter craziness, and hope everyone enjoys it. Those with The Ooze Pits in your Crawler's Companion Kickstarter reward package should be receiving your download links. If not, let me know! Thanks everyone for the awesome support. As usual, stuffed with interesting NPCS! "You folks been acting like you’ve got hold of some peculiar pipeweed!" Thanks Sherrif! Creating quirky personalities for the players to meet is probably my favorite part of the process. Excellent news! I will be purchasing post-haste. Will this one also become available in print? I picked up the first in both formats! Yes, the print version (in lovely full color) should be available within two weeks. I've started an "Anatomy of a DCC Campaign" series on my blog; I'll throw you a shout when I get to running Perils! Very good news indeed! Everything I've seen about this is positive. How long does "now" last? I haven't purchased PotSC yet but eventually want the combo. When I say 'combo' I'm referring to the print and pdf versions of the same adventure. I'm guessing you're referring to 'bundling' -you want to purchase both Perils and Ooze Pits together... I'm still working on that. No, I actually was thinking of a Print+PDF combo. I mentioned PotSC because I don't have that one, either, and wondered how long I could wait and still get Print+PDF for it. Or how that works. My eventual plan was to do both print and PDF for the module trilogy, but now I have to consider the hardback versus individual modules. Darn you. As soon as the print version arrives for any adventure, you'll always be able to add on the PDF for a couple bucks more: that 'deal' will never go away. Just put together the "Perilous Ooze" bundle: if you haven't yet purchased either Sunken City Adventure yet, you can get PDF's of both Perils of the Sunken City and The Ooze Pits of Jonas Gralk for $8.99 and save a buck.